Membership makes the difference. Best Western International is the world’s largest hotel chain. Each Best Western is independently owned and operated. Becoming a member of the largest hotel chain has its benefits, and that is precisely the message to prospective members in this 16-page brochure: Independent hoteliers united to promote their properties and increase profitability. 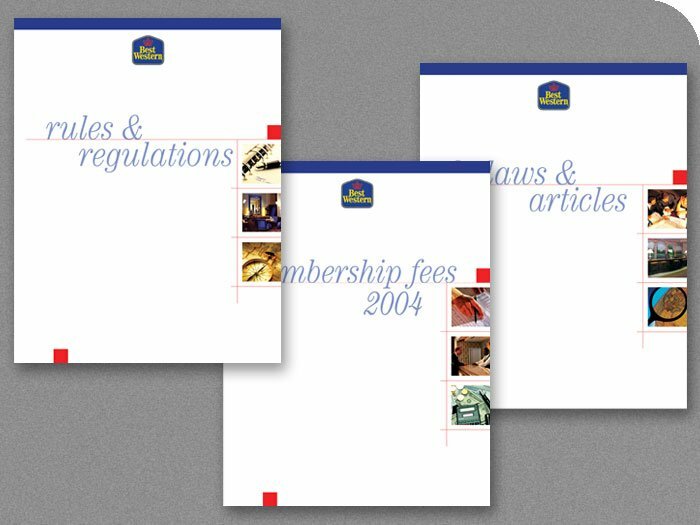 This 16-page brochure (Membership Makes the Difference) works in tandem with four other booklets: New Construction and Refurbishment Guidelines, Bylaws & Articles, Rules & Regulations, and Membership Fees. All five booklets are presented in an attractive folio with fluted ivory cover stock and gold foil-stamped logo and tie closure. 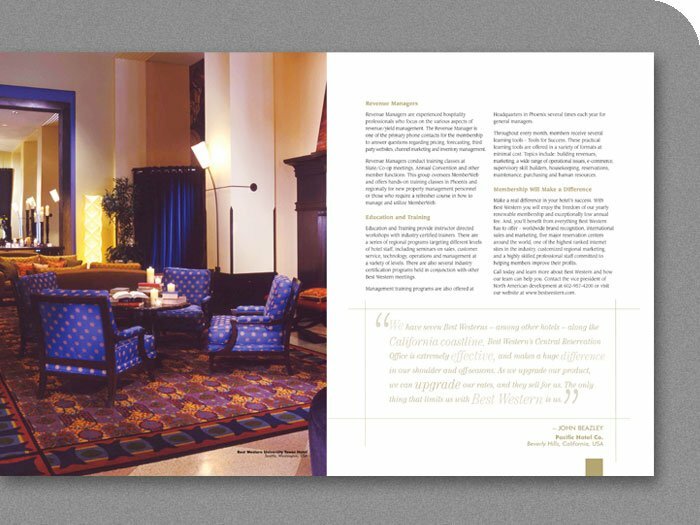 This page spread featured Best Western University Tower Hotel in Seattle, WA, pictured on left page. Featured quoted on the right:“We have seven Best Westerns — among other hotels — along the California coastline. Best Western’s Central Reservation Office is extremely effective, and makes a huge difference in our shoulder and off-seasons. As we upgrade our product, we can upgrade our rates, and they sell for us. The only thing that limits us with Best Western is us.” (John Beazley, Pacific Hotel Co., Beverly Hills, CA. 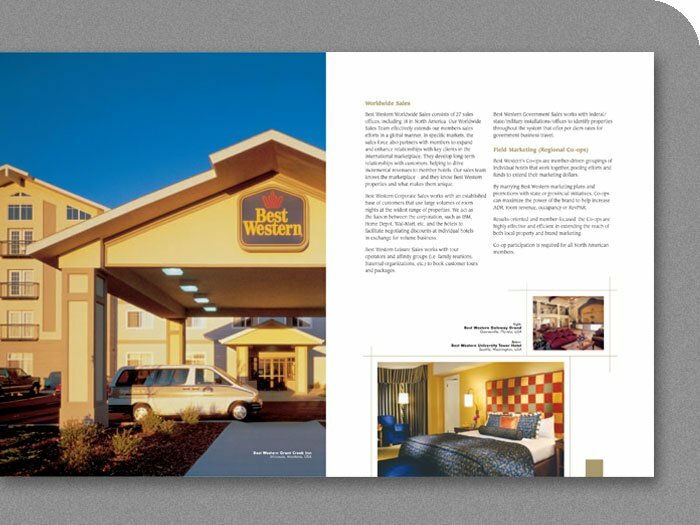 This page spread featured Best Western Grant Creek Inn in Missoula, Montana, pictured on left page. At right, Best Western Gateway Grand in Gainsville, FL and Best Western University Tower Hotel in Seattle, WA. In addition to the Membership Benefits 16-page brochure this kit also included 4 booklets: Rules & Regulations, Membership Fees, Bylaws & Articles and Construction Guidelines (not pictured here). All followed Best Western’s brand guidelines and approved corporate color palette.